Here's something we don't see everyday -- an online gambling company with a big heart! 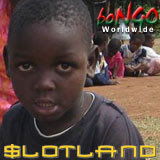 Slotland.com has launched a website to raise additional funds for the school and community center they built in Malawi and to bring hope to other nearby villages. While the popular slots and video poker site will continue to fund the center, the new website (http://www.help-malawi-children-charity.org/) has been created to enable the public to make personal donations. Education is the key to ending the cycle of poverty and ignorance in Malawi, one of the poorest nations on earth, ravaged by AIDS. The school’s opening ceremonies last October began a new era of hope for one impoverished village. Two years ago, when a small group of dedicated aid workers approached Slotland.com for a donation, the company -- known for its generous philanthropy -- couldn’t say no. In fact, they committed to providing all construction funding and to supporting the center until it is self-sufficient. The story of how the Project Team brought a whole village together to build the Umodzi-Mbame School is told on the new fundraising website: http://www.help-malawi-children-charity.org/. The site also explains how donations will be used to assist neighbouring villages that have started similar projects on their own. Donations toward current and new projects can be made on the site through secure PayPal payment processing. The Project Team in Africa has registered a non-profit organization called boNGO Worldwide which is committed to assisting communities develop self-sustaining projects. boNGO is an acronym for “Based On Need-driven Grassroots Ownership”. boNGO’s diligent work has already changed the lives of hundreds of children but there are many more that need food, education and hope. All contributions are gratefully received and, since there are no administrative costs thanks to Slotland.com, every penny goes directly to the Project Team in Malawi.